“Kiwami”, meaning “extreme” in Japanese, is a word that best encapsulates the Yakuza series in general. It leaves subtly at the door, runs out of the house, puts on its rocket and skates and blasts to the moon. Yakuza Kiwami is a remake of the first Yakuza game, which SEGA published in 2006 on Western and European shores. Back then, SEGA went all in. Japanese games on console still had a hard time breaking the market if they weren’t RPGs or mascots, but Yakuza seemed like it had elements that resonated with an audience outside of Japan: mafia types, brutal action, and non-linear, sandbox gameplay on a smaller scale of the hugely popular GTA series (and its ilk). SEGA brought on some big names to lend their voice talents to Yakuza’s original release. You had Michael Madsen, Eliza Dushku and Mark Hamill among the cast. It was released to favourable reviews, but never quite reached the heights it did in Japan. Still, the game has been a powerhouse in the east, and things have been looking up since Yakuza 0 hit the shelves. Yakuza Kiwami may be a response to a couple of factors: the games’ burgeoning success in the west, player demand, and a chance to ingratiate newer gamers to the Yakuza series with the upcoming sixth titled entry into the series. The game runs on the same engine as Yakuza 0, which means combat, locations, and cinematics possess the same quality. But it also still poses the same issues with quite severe pop-in. You’ll be running around the streets, and just a few steps in front of you, trash and other objects will appear. It doesn’t spoil my enjoyment, but, perhaps, does reveal a little lack of polish. 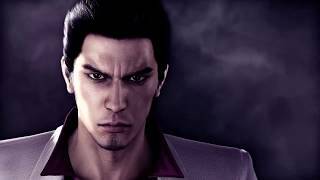 In Yakuza Kiwami, you step back into the shoes of Kazama Kiryu, a member/ex-member of the Dojima crime family. He’s stoic, has a heart of gold, and is living embodiment of bad-assery. When he takes the blame for his friend Nishiki having killed the patriarch of the Dojima family, he’s sent down for 10 years. Upon his release, he discovers that not only the world around him has entered a digital age, but friends have become enemies and enemies have become friends. Along the way, he finds himself tied to Haruka, the young daughter of his friend’s sister (both of whom have disappeared), taking with them the location of 10 billion yen, which belongs to the Yakuza’s families. Mass beat-downs ensue. Combat is king in Yakuza. From the first instalment, it made you think of games like Virtua Fighter mixed with Shenmue. It’s quick, visceral, and satisfying, like trying to wolf down ice cream on a rollercoaster. You have four styles to choose from: Brawler, a no-nonsense balance of speed and power; Beast is slow but powerful, allowing you to shrug off damage and not lose a beat as you heft up and wield any weapon you come into contact with; Rush is a rapid, weaving boxer archetype great for dodging attacks and jumping in with rapid strikes; finally, Dragon is a nod to the original Yakuza combat style from the first five games. Kiryu levels up his abilities by gaining XP from defeating enemies and completing missions/sub-stories. Levelling up your character is no longer such a long slog as it once had been. There’s plenty of XP you can gain organically, by engaging in side-quests and generally exploring the world. Through this, changing styles on the fly, learning newer, more powerful moves, and discovering new methods of bringing the pain, increases exponentially. Kiryu can become a god near the endgame. You can unleash crushing HEAT moves—devastating special attacks like slamming someone’s head into a car door, swinging a golf club at their bonce, and tons more. There’s a real sense of being a one-man army. One gripe with this system is the pace at which you learn the Dragon abilities. One method has you engaging in the Majima Everywhere mini-game/side-quest. Majima is a friend/antagonist who is obsessed with Kiryu. The two met briefly in Yakuza 0, but he slowly grew in insanity and prominence as the games progressed. After Kiryu’s ten years in the joint, Majima thinks the man’s gone soft. So, you beat the spit out of Majima every chance you get to gain new skills. You’ll find him in a trash can, in the sewer, invading your photo booth pictures—even your fights. It’s as if he’s a character in a Dr. Seuss book. And the mode in itself is a lot of fun. The gripe lies in which moves you learn first. A number of them aren’t too useful in normal combat—which you engage in the most. The staples of any battle are regular combos and HEAT actions. But you don’t learn these until much later in Majima Anywhere, which means the Dragon style takes a little too long to actually become a viable combat option. As the Yakuza games progressed, their setpieces became more bombastic and interesting, and the plot points became a little wilder. As this was the first game in spirit, events are little more subdued. Despite Kamurocho being vividly brought to life, some of the other plot-related locations amount to not much more than corridors your run through, battling goons. Yakuza Kiwami posits itself as a classic mob movie in its premise and execution. What elevates its story are the characters and setpieces. The city in which it takes place, Kamurocho (a red-light district), is vibrant, gaudy, seedy, neon-soaked, violent, and often hilarious. The game manages to strike a balance with its light-hearted, comedic moments and more serious, tangled mystery brimming with violent and vengeful characters. The story is far from perfect, however. For me, the original’s story is perhaps the weakest of the bunch. In the original game, you face many antagonists and don’t spend enough time interacting to get a good handle on just who they are. This was especially prevalent for Nishiki, a former friend of Kiryu. He just ended up being bad and you had very little insight into his motivation. Yakuza Kiwami goes a way to remedy this, bookending each game chapter by flashing back to formative moments in the ten years since Kiryu left. We get to see how Nishiki, now by himself, has to climb the ranks to save his own sister and the questionable choices he makes in this pursuit. Due to the fact this is a remake, there are still issues with “filler”, in particular as the game reaches its later chapters. Obviously, the constraints of following an origin story doesn’t leave you much wiggle room to drastically change events. You can only buff what’s already there. But what you do have is a story that is all about family and the lengths you will go to in protecting them. 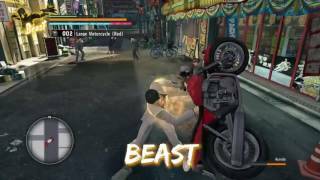 Yakuza Kiwami captures these themes extremely well, and, if you look close enough, you’ll discover that the motivations for characters and their actions all feed back to this central theme fantastically. As well as combat and story, Yakuza’s known for its sub-quests and mini-games. Kiwami manages to balance all these elements fantastically. For many who play these games, all the extra content can seem quite a slog, especially when it comes to charming hostesses, time-consuming mini-games, and other endeavours that don’t reward you too heavily. Kiwami boils its larger mini-games down to fun, engaging flights of fancy that don’t outstay their welcome. The first, larger mini-game is MesuKing: Battle Bug Beauties. It’s like Dead or Alive Beach Volleyball had a child with rock-paper-scissors. You collect cards, with scantily clad women who all wear beetle-themed outfits. There are player cards (the character you use in battle), and skill cards that fit into one of the three rock-paper-scissor groups. Once you’ve chosen your character and equipped skills, you battle kids in SEGA arcades. The characters leave nothing to the imagination as both combatants wrestle in next to nothing as different species of beetles cheer them on. The game is fun, you can find cards around town, and it provides a nice bit of pacing in between fighting. Pocket Circuit makes a return from Yakuza 0, which players may remember as Scalextric/Hot Wheels. In it, you race small, remote-controlled cars around a track against several others. Unlike the previous game, the mode is more strategic, races are quicker, and it forces you to change up your tactics. It’s another streamlined distraction that takes just the right amount of time. The coliseum features in the game, in which Kiryu battles a series of opponents for points that can be exchanged for prizes. These prizes include the special items required to be trained by Komaki, an ancient martial artist, unlocking some extremely useful moves. Again, it’s a mode that goes beyond an insular experience and provides tangible value in other parts of the game. The other side-stories, while not as funny as in later entries, are still a step above most games. They each tell little stories about life in the city, personal problems, and add a little more depth to your environment. Kiryu functions like Jerry Springer. However, instead of standing by while the guests fight, you actively start the battle and finish it. Whether it’s helping someone off a ledge, bringing someone stuck on the toilet some tissues, or reminiscing about the ‘80s, some sub-stories offer a nice change of pace. The game’s soundtrack feels sparse in places, particularly as you’re roaming the city. While there is battle music, and some nice pieces used in cut scenes, you’re left with more ambient sounds—namely people swearing at you—as you sprint along the streets. And I still find it funny that, over a decade later, the menu system in Yakuza hasn’t changed. It’s bare bones and simple to use. However, the tutorials are not very clear, especially on newer mechanics such as “Kiwami” special attacks and even something as simple as knowing how to draw your equipped weapon. Perhaps one of the most surprising things about Yakuza Kiwami was the price. I’d assumed it would be standard retail price, but was pleasantly surprised to discover it was little more than half the cost of a regular AAA title. Quite frankly, it’s a bit of a steal. If you’re someone who loves the series, purchasing it is a no-brainer. If you’ve been on the fence about the game since hearing about the other instalments, Yakuza Kiwami is a great jumping off point. There is over 30 hours of gameplay waiting for you on the streets of Kamurocho. Even if you’re looking for a quick distraction until the slew of more games in late September and beyond, there is a lot to love, as the game feels a lot less bloated than previous entries. For those a little hesitant about jumping into a game in a long-standing series - don’t - because it’s a blast. While Yakuza Kiwami captures Kamurocho in all its seedy glory, there is a marked difference between character models in the main cast. Models used in previous entries were carried over well, but others simply look waxy and little lifeless. Oftentimes, interiors are lacking character. Visceral combat, a refined leveling system, and an absolute ton of stuff to distract you when not bringing the pain, Yakuza Kiwami can keep your attention without becoming a chore. Sub-stories, mini-games, and a wealth of things to collect and explore make for a great experience. While the story is strong in theme, and includes better characterisation, the plot can be somewhat dull at times, with a lot of back and forth between locales. Antagonists, while much improved, still don’t reach the heights of later entries. And set pieces, while fun, lack depth. Menus are simple—verging on peculiarly rudimentary. There is a lot of delving deeper into menus that could have been streamlined. Pop-in is a visible issue, but loading times are rapid, and I’ve experienced no crashes or soft-locks. Yakuza Kiwami presents the strongest mechanics in the franchise’s history, as well as refined side missions and lots of fun distractions that create a fantastic reimagining of a great game. Yakuza Kiwami is ranked #466 out of 1436 total reviewed games. It is ranked #36 out of 174 games reviewed in 2017.